They came on very strong, and fighting for those berries. I thought robins would go south some time ago, but they are still here in mid January, unless they are not robins? There are days when this little tree are just full of birds with tons of noises. We moved here about a month ago, and I am still trying to get to know this new territory. It is a small area, but it will do just fine for me. 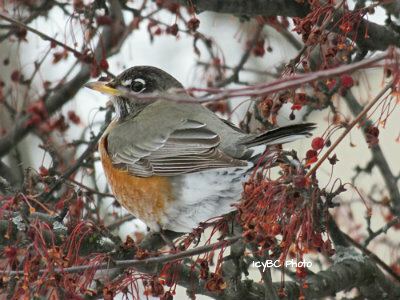 Beautiful photos they look like robins to me! 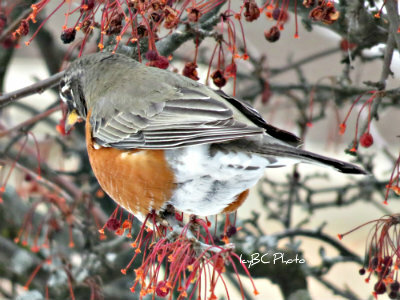 Great pictures of the robins. I miss the robins in the winter. They don't come around in the winter where I live now. 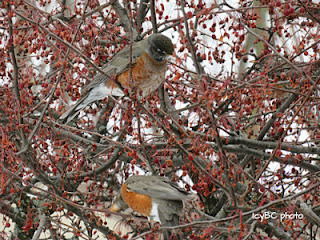 They look like Robins to me, but don't take my word for it. Nice photos, whatever they are! Icy if you try the Daikon recipe, I would start with one small daikon and a medium sized carrot, it will make about 2 jam jars' worth that is plenty. Use the same amount of rice vinegar, etc.